Description: There's a big day coming up in the Ice Kingdom, the long awaited wedding of a princess and prince, but the groom has no outfit, lucky for him Ice Queen is here to help him. 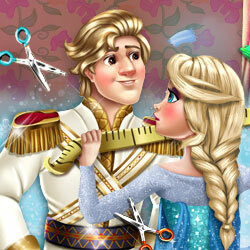 Join the queen in her magical designer studio and get everything ready for the prince's transformation. Find the missing objects, clean up the studio, create an elegant suit and make the groom look handsome for the incredible wedding.